Meeting the Common Core for ELA, Part One: How does the C3 Framework Align to the Common Core? 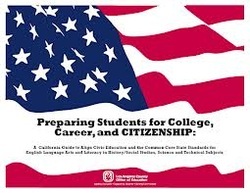 This excellent website provides many links to common core sources, lesson plans, etc. 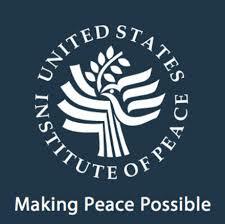 ​The U.S. Institute of Peace works to prevent, mitigate, and resolve violent conflict around the world by engaging directly in conflict zones and by providing analysis, education, and resources to those working for peace. Created by Congress in 1984 as an independent, nonpartisan, federally funded organization, USIP’s staff work at the Institute’s DC headquarters and on the ground in the world’s most dangerous regions. In addition to our work overseas, USIP offers American educators a number of resources to bring global peace-building to life in the classroom, all of which are available for free on our website at www.usip.org/public-education. Our Peacebuilding Toolkit for Educators is a curriculum guide developed by teachers, for teachers. The two volumes – one for middle school and one for high school – provide lessons that highlight the challenges and importance of global peace-building. The activities focus on practical skills in conflict management, including conflict analysis, negotiation, mediation, and problem-solving. These skills are applied in a range of contexts, encouraging students to think about how they can contribute to peace-building in their own lives and in a global context. Our website contains additional lessons and activities, professional development opportunities, and information on critical international conflicts and issues. We also offer onsite educational program for students and teachers. Origins: Current Events in Historical Perspectives is a free, on-line magazine that includes articles, podcasts, short “milestones,” and Top Ten lists produced by some of America’s leading historians -- and all connecting the past with the present. Origins covers the globe. The magazine is designed for use in high school and college classes in American history, world history, current events, and contemporary politics. It is a joint production of the history departments at Ohio State University and Miami University. You and your students can find it at origins.osu.edu. To see the full survey, results from previous C-SPAN Supreme Court surveys and to watch a video of the current Supreme Court justices giving their opinion on cameras in the court, visit our Supreme Court Survey website. C-SPAN Classroom Deliberations, a site produced by C-SPAN's Senior Fellows, has been updated with a new lesson to help your students deliberate the following issue: Lesson: What is the Role of the U.S. Senate During the Supreme Court Confirmation Process? An eleven month vacancy to the Supreme Court was suddenly created after the death of Associate Justice Antonin Scalia in February of 2016. Article II of the U.S. Constitution expressly gives the president the power to "nominate, and by and with the advice and consent of the Senate, shall appoint... Justices of the Supreme Court." Senate Republicans, led by majority leader Mitch McConnell, blocked President Obama's appointee by refusing to schedule hearings until after the 2016 presidential election. After the inauguration of Donald J. Trump in January of 2017, the newly elected president picked 10th Circuit Court of Appeals Judge Neil Gorsuch to fill the vacancy. On March 20, 2017, the Senate judiciary committee began hearings to question Judge Gorsuch on his interpretation of the U.S. Constitution and his judicial record. In the past, hearings have served as opportunities for Senators to question appointees in order to learn how they would rule on significant constitutional issues. However, considering the ambiguity of "advice and consent," some question the exact role of the Senate and purpose of the hearings. This deliberation will explore the confirmation process and what role the Senate plays in appointing a Supreme Court Justice. Given the thin majority Republicans have in the Senate (52-48), the role could be quite influential if the majority invokes the "nuclear" rule allowing Gorsuch to be confirmed with a simple majority vote. What is the role of the U.S. Senate during the Supreme Court confirmation process? Should the Electoral College be Reformed in the United States? Should the Death Penalty Continue to be Used in the United States? Should the government have the ability to lawfully access encrypted technology and communications? Should the U.S. grant asylum to refugees displaced from nations that have state-sponsored terrorism? Veterans National Education Program or V-NEP provides free, high quality, educational resources that emphasize the humanistic & cultural aspects of America's military engagements, past & present, and how these events influence the fabric of our global society. Bring history, geography & current affairs classes to life! 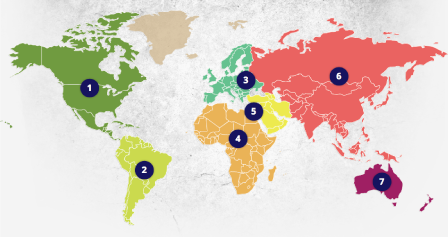 Through our interactive Global Map, subject matter experts explain the cultural issues, history and key geopolitical events that shape the world we live in. Tune-in to C-SPAN on Sunday, April 30 from 9:00 - 10:00am ET as teachers Dan Larsen and Andrew Conneen from Adlai E. Stevenson High School in Lincolnshire, Illinois join us for our annual program to help A.P. Government and Politics students around the country prepare for their upcoming exam on Thursday, May 4. Dan and Andrew will discuss the exam, preview sample questions, and make suggestions as to what students should be studying. They will also respond to student questions asked via telephone, email, and social media. The Federal Reserve is often in the news, yet few Americans understand "The Fed's" role in our economy. I wanted to let you know about a great teaching resource to add to your classroom without cost. You simply order from the link below to provide your mailing address and the kit arrives. That's it. It just takes 30 seconds of your time. This kit is a professionally designed lesson plan produced by the Federal Reserve Bank of Chicago. It is suitable for use in high school government, social studies, personal finance and economics classes. The kit has been designed to give teachers hands-on activities to explain the role of the Fed. The kit's curriculum guide emphasizes key points that teachers can highlight while presenting topics like how prices, inflation and ultimately monetary policy affect our economy. The kit also includes a short movie and classroom presentation on a CD, plus a bag of Fed Shreds to support conversations around money supply and what happens to old money. To have a complimentary kit shipped to you or to learn more, go to: <<http://www.dynamindspublishing.com/free/fed.html>> Just provide your shipping address - that's all. Allow three weeks for arrival. DynaMinds Publishing produces and distributes financial education curriculum, books and games. "What We Do at the Federal Reserve" was created by the Federal Reserve Bank of Chicago. Social Studies Simulations for Sharing - This Google Doc lists 8 pages of online social studies simulations to use in the classroom. These are great interactive sites for students to learn and review History and Geography. The Annenberg Foundation has sponsored the creation of several interactive History websites inlcuding: Collapse, Middle Ages, Renaissance, and United States History Map. Explore the collapse of four ancient civilizations. Learn how archaeologists find and interpret evidence. Discover what it was like to live during the Middle Ages. With a map as your guide, trace the growth and settlement of the United States. 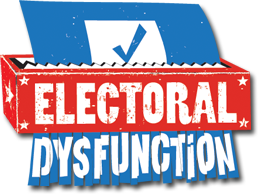 We’re pleased to announce that Electoral Dysfunction is now available at no charge for use in middle school and high school classes. The 36-minute Classroom Edition of the award-winning PBS documentary is accompanied by an extensive curriculum guide. Officially endorsed by The National Council for the Social Studies (NCSS), this video is hosted by Emmy-winning political humorist Mo Rocca, who takes a road trip to explore voting in America. Topics addressed include Constitutional provisions on voting and voting rights; the origins and present-day impact of the Electoral College; voter ID laws; ballot design; inconsistencies among America’s 13,000 voting jurisdictions; and reforms that would make elections fairer and more uniform. » To download the Curriculum Guide, click here. The Institute for Curriculum Services is a national resource center which promotes accurate curricular materials and instruction on Jews, Judaism, and Israel for American K-12 students. ICS improves the education of millions of public and private school students who learn about Jews, Judaism, and Israel in social studies classes each year. Our website, www.icsresources.org, hosts a variety of resources for teachers and engaging curricula for classroom use including detailed lesson plans, classroom activities, primary source documents, and maps. Part of our mission at the ISBA is to educate the public and students of all ages about the important role of lawyers and judges, the importance of an independent judiciary for the proper administration of justice, and to foster an interest in students to respect our justice system and consider pursuing careers in the law. Bring Abraham Lincoln into your classroom! Kevin Wood, currently of Oak Park, Illinois, portrays President Abraham Lincoln, one of our nation's most beloved and esteemed historical figures. As President, Mr. Lincoln ably led our nation through its darkest days, when brother fought against brother, and the fabric of our "more perfect Union" was nearly torn asunder. As one who rose from obscurity to the highest office in the land, Mr. Lincoln is an inspiration to us today to likewise dream, and to work hard to achieve those dreams. As one who persevered in self-study to become a well-educated man, Mr. Lincoln embodies for us the high value of education and a great passion for learning. As the leader of our nation during our greatest crisis, Mr. Lincoln challenges us to contemplate and to cherish the ideals for which our country stands: liberty and freedom, democracy, equality, and opportunity. And as one who was known for his honesty, humility, and compassion, Mr. Lincoln provides an enduring example of the importance of a strong moral foundation and positive character development. Presentations are available either in English or Spanish, in addition to more limited presentations in French or German. Bring Mary Todd Lincoln into your classroom! ​Mary Todd Lincoln lived a life filled and tragedies but few people know her story. Now, historical interpreter Laura F. Keyes shares Mrs. Lincoln’s story in educational programs, each one hour long, set in at important moments in throughout her lifetime. These programs can be tailored to suit a variety of ages and interest groups. Keyes’ meticulously researched performances have received wonderful reviews and should not be missed.